I had been wondering for awhile how to make a holiday card with the pintos and I knew I couldn't put a wreath on one of them, since they are wild. Low and behold one day Polka Dot shows up at the back door with this branch stuck to her! Thank you Polka Dot! The Pintos and I wish you a wonderful New Year ahead and may it be filled with joy, peace and health for everyone! It has been awhile since I have written a post. 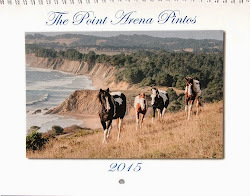 December has been very busy with lots of pinto calendar sales and greeting card orders. 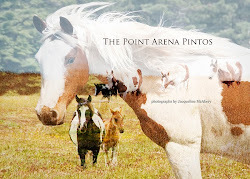 The weather has often been foggy and rainy and so the pintos did not come up as often. Suki is definitly going to be whte and black (rather than brown-for awhile he was looking lighter). He is getting bigger every time I see him. He has a trusting personality and now eats his share of alpha squares and carrots. He allows me to hug him and is a delight to watch when he runs. Been trying for awhile to get a photo of him next to his father, Thunder and this is the best one so far.